Another spooky ❤️ Shout out. Besides it being so amazing for me, it gives me peace of mind with my daughter that I can help her even though mommy isn’t there. 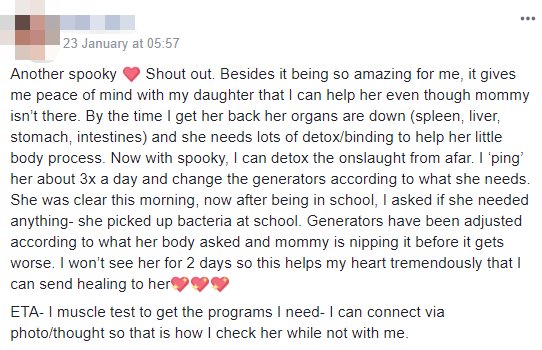 By the time I get her back her organs are down (spleen, liver, stomach, intestines) and she needs lots of detox/binding to help her little body process. Now with spooky, I can detox the onslaught from afar. I ‘ping’ her about 3x a day and change the generators according to what she needs. She was clear this morning, now after being in school, I asked if she needed anything- she picked up bacteria at school. Generators have been adjusted according to what her body asked and mommy is nipping it before it gets worse. I won’t see her for 2 days so this helps my heart tremendously that I can send healing to her??? ETA- I muscle test to get the programs I need- I can connect via photo/thought so that is how I check her while not with me.